For those under extreme time crunches, tending to aquarium lights and plants can be hard to fit into the day. Finding the right, low light aquarium plant to suit your tank will greatly reduce the amount of time and money your tank needs to stay looking gorgeous. By adding low light aquarium plants we can easily gain all of these benefits without breaking the bank. A slow growing, low light aquarium plant is the ultimate in low maintenance aquarium plants. With wide leaves that measure up to 5 cm wide, these plants soak in every ounce of light they get. This ensures growth in even the weakest light settings. By adding soil rich substrate owners will see a rich dark green color in the leaves, creating a highly desirable contrast between most substrates. Propagating Cryptocoryne is a quick process as well. simply cut the stems to your desired height and leave the remainder of the plant in your tank. The stem will continue growing and the portion you remove takes the absorbed toxins with it. 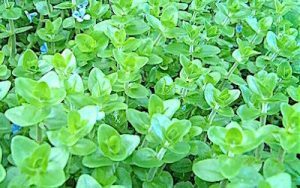 In Short: This plant grows slowly, making it easy to manage. In addition care is quick and easy, further reducing the work needed to maintain your aquascape. A short bush like plant, Monosolenium makes great under water hedges. The plant often settles in the bottom of aquariums, forming a cushion at the bottom. While they can be soft to the touch, Monosolenium is actually a brittle plant that can break apart easily if mishandled. Because this is a shorter plant it requires a little bit more light, but nothing the standard hood doesn’t come with. When first placing these plants into the aquarium we have had great success tying them to rocks using fishing line. This holds the plant in place, giving the roots time to anchor themselves into your rock or substrate. To control spreading simply cut the plant at the base and remove the unwanted portion. These plants grow wide rather than tall, so you may have to do a bit of digging to get a hold of their roots. In Short: The Monosolenium grows slowly and evenly. It will require a basic light, meaning if you have purchased anything to light your tank it will thrive. Placing the plant into your tank and propagation will be the most difficult parts of caring for this plant, still taking only a few minutes of time. When you’re looking for a thinner fern like plant, the Sagittaria is the go to for most aquarists. These plants can really spread quickly, making a single plant enough to cover an aquarium. These plants will come in potted soil that you can place beneath your substrate and will help accelerate initial growth. Cover the top of the soil with your own substrate to avoid an unwanted patch of brown. These plants grow their leaves in all directions, making directing their growth difficult. The plant spreads by reaching out a root and forming additional bodies. These are what you will want to cut off and replant to control where the plant grows. These plants spread fast! be sure you are up to the task of limiting their growth or allowing them to completely take over the base of your tank. We have actually enjoyed the low to the ground foliage, as out pleco can run around underneath, suddenly jumping out from the leaves and causing nearby fish to flee. The height of these plants greatly vary. Most will stick low to the ground, only having their leaves reach up as they sway in the water. Do be prepared to deal with random extreme growth, as one or two of these plants may choose to shoot for the surface. We have only seen this one time, and with long leaves it takes only a few seconds of propagation to deal with. In Short: Sagittaria is a quick growing plant that typically remains low to the ground. it needs very little light and can send new stems upward if in need of stronger light. As with all long plants, the Sagittaria can easily be cut to size in a few seconds. 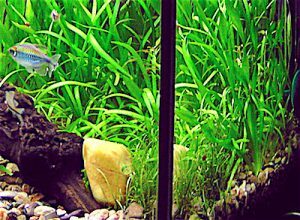 Control the growth and these plants create a wonderful base in freshwater aquariums. When looking to get some floating plants we love pointing to Salvinia Natans. These little ferns go right to the top, creating shade for fish and getting direct light for themselves. This takes out the depth of tank factor, making the light level needed exceedingly low. With the plants floating nature, high growth speed has nothing to do with propagation time. Simply pull out however much you want and you’re done. No tools needed. The reason for a care level of medium is the shade they create. This will not harm your fish but can prevent other plants from getting the light they need. So while these plants require almost no attention alone, having other plants in the tank can be a bit of a hassle. To prevent unwanted coverage, place slightly below water barriers along the top of your aquarium. This keeps the bulbs in place and will restrict growth to the desired area. Watch the coloration in these plants for signs of low nutrients. When there is not enough nutrients in the water to support all the plants, the leaves will turn a lighter color, allowing at a glance health inspections. Add more nutrients or lower your plant count to get back on track. Finally the shade component also offers one last benefit. Algae reduction. While beneficial bacteria requires no lights to grow, algae thrives in strong light areas. 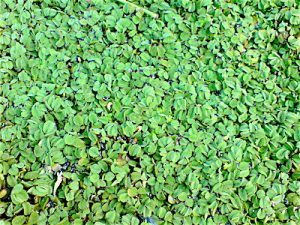 Creating a canopy of Salvinia will quickly block out large amounts of light, causing slower growth for unsightly algae spots. In Short: As far as floating plants go we cannot recommend these highly enough. The shade provided can put your fish at ease and lower their stress level. By floating at the top of your tank propagation takes literal seconds, making the high growth rate perfect for fighting Nitrates and fish waste. Provided you do not block out other plants light source, Salvinia is one of if not the easiest plant to care for. Crawling into our half way mark, Taxiphyllum is a climbing plant that provides a unique look to our tanks. The shape is often noted to resemble a Christmas tree, but to be year round we like to think of just normal pine trees. The climbing nature of this plants makes it more suited to aquariums with lots of vertical decor that the owner would enjoy some green. Due to how it climbs and wraps around objects, Taxiphyllum plants will always be facing their light source. This allows owners without a light strip to worry less about their plants lighting. Propagation for these is a bit tricky. To transfer to new objects the owner must cut off a portion of the plant and tie it to the new location. Then the plant will begin to coil around it’s new home, reaching both up and down the object as it grows. When cutting off new portions be mindful to cut as few branches off the plant. While one or two lost branches wont cause too much trouble, over propagating can leave the plant in pieces, unable to reattach to a surface without a lengthy regrowth period. For those new to live plants and familiar with the dangers of spiky fake plastics plants, let us put your fears to rest. 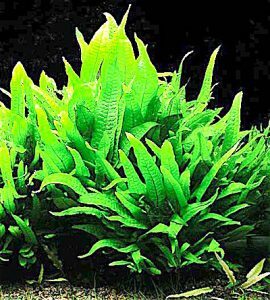 While Taxiphyllum is a spiky plant, the spikes will bend long before your fish can cause themselves any harm. Unlike the Monosolenium these spikes are not so brittle that they will easily break, making plant fish interaction completely safe. In Short: This climbing plant will be a nice colorful addition to aquariums with lots of vertical decorations. The placement and propagation are not the easiest. 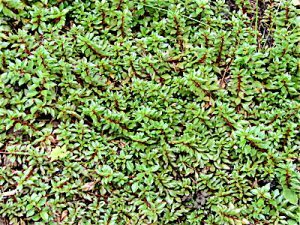 The spiky nature of Taxiphyllum is not a danger to fish as with plastic plants, and the plant will not grow fast enough to become out of hand. With all the green we thought you guys might like a bright pink plant to add to your low light needs. The Ludwigia boasts a vibrant pink and red color set along with easy to care for attributes. Ludwigia grows in a normal upright fashion, branching out and creating leaves along the way. These provide a dense forest for your fish to swim into and seek shelter without forcing them low to the ground. Reaching greater heights also allows these plants to survive under dim circumstances, making for a hardy freshwater plant. Having a growth speed of average along with the tall body shape, Ludwigia is also one of the more quickly propagated plants. You can either pull out entire plants and re position them or cut the stems to keep them from getting too tall. Speaking of height, the Ludwigia can get fairly tall, making it a background plant. Keep in mind if your fish are pink or red they may become hard to see against the same color these plants provide. It;s up to you to choose: is your plant selection going to be a stunning backdrop for Hatchet fish, or will your tank become a game of spot the red tail Swordfish? In Short: The Ludwigia provides a bright background for your aquariums while being easy to maintain. The health is easy to watch, as any brown spots or holes will show easily against the pink/red colors. Fish will be able to swim between these happily provided you don’t plant them too close. Their lighting needs are low and propagation is quick. Unlike most ferns, Microsorum excels at slow growth and easy propagation. 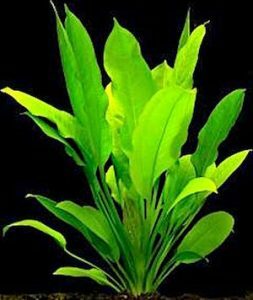 For owners who frequently have busy spells where they can only feed the fish before heading out the door, this slow growing plant can be the perfect answer to their low light aquarium plant needs. First off we will warn you: this plant grows slow. “But I thought that was the point of choosing this?” Yes, while slow growth is a key factor, we just need to let you know a single plant will not be able to spread to multiple locations in a timely fashion. If you want multiple bodies of Microsorum we recommend you start with at least two plants rather than one. 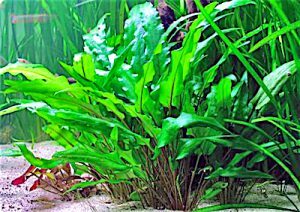 The fern like shape is complimented by the extra thin leaves, allowing fish to brush by with next to no resistance by the plant. Combined with in tank water movement via power heads or water pumps and your Microsorum will create a rolling grass field look. Because these leaves repel fish less than most other plants, they provide inviting refugee to bullied fish or safe sleeping locations. Consider using multiple of these plants when housing territorial fish. As with most ferns these spread by reaching out with roots and forming additional bodies. Owners can separate these and replant them, but be sure they have enough leaves and are not dependent on the main body. In Short: An easy, slow growing plant, the Microsorum is best used by owners with little free time. By using multiple ferns aggression caused by territories will be cut down, along with allowing fry and new fish a chance to fit in with their new tank mates. Propagation is infrequent and light requirements will be met by any form of aquarium lighting. One of the few stem plants originating in the us, The Bacopa is a tall, straight growing stem plant with leaves shooting out at regular intervals. These leaves stay close to 1.5″ long, making dense clumps of plants a bad idea. Being tall with rigid outward leaves, the lighting required for this plant are fairly low. Unlike typical stem plants, the Bacopa grows fairly slow, cutting down on trimming and propagation needs. The difficulty in propagation lies in the plants wide leaves and strong stems. Given any amount of water flow, new plants can easily find themselves uprooted. Because they don’t do well in dense clumps and are tall, we recommend placing sporadic groups along the back wall of your aquarium. This will create a background without just putting up a wall of green. Due to the rigid nature of the stems and leaves, these plants should be treated more as walls for fish than brush for hiding. Try combining Bacopa with some shrub or fern like plants. In Short: Bacopa Caroliniana is best used as a background, giving a few inches behind them to allow fish territories and hiding places to be formed. Their slow growth time and rigid stems allow for low maintenance and east alignment. High flow tanks will have difficulty planting these, so consider turning off power heads for a day or two to allow roots time to spread. In order to maintain the perfect ball shape, the plant must be rotated every few days. In order to spread the plant, you must divide it and secure the new piece into place. When allowed to reach the floor of the aquarium as a cut piece, Cladophora can form a lush carpet of green moss. If this is a look you like you are free to do so, but we much prefer the unique looking balls of fluff. 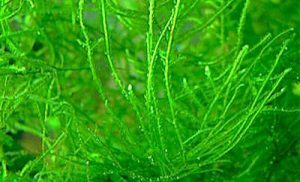 As this is an algae you will find it very difficult to kill with poor handling. Low lights and rare trimming will not phase the algae. Thanks to the bright and soft nature of Cladophora many fish will enjoy rubbing into the algae or even selecting it as host, much like clown fish and their anemones. The balls are dense however and provide little protection from aggressive fish. 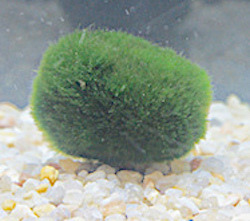 In Short: These little balls of algae really add a lot of character to your fish tank. proper, easy care will see to it that the algae does not spread to unwanted areas and even limits algae growth by eating the same nutrients other algae requires. The algae is basically impossible to kill on accident, making this the easiest addition you can have in your tank. Finishing off our list, Echinodorus is a hybrid plant, combining both long and short stems, both ending in multicolored oval shape leaves. Even under low lights this aquatic plant will retain its colors and dark leopard like spots. Varying heights make this plant accustomed to be both in the center and back of aquariums. Long stems will reach up for light, while short stems reach out to collect the light missed by their upraised friends. Given the middle ground placement, Echinodorus will provide fish with both refuge and divide the tank into multiple territories with its taller stems. To propagate cut both tall and short stems evenly on opposite sides. Cutting off too much from one side can leave the plant lopsided, making uprooting by water movement more likely and reducing the effectiveness of the remaining leaves. When trying to spread out the plant, bury one of the tallest stems you can find in an open area. the leaf will be on its own for awhile. Giving it space and height will create the best survival rate for new plants. The plant grows at an average speed, making new plants sprout in a few days after propagation. Besides self planting, Echinodorus may reach out with its root and begin a new, smaller version of itself. You can choose to remove this or allow them to expand. The secondary plants will likely not reach full size while connected to the host body, so consider clipping the connecting stems after some growth has taken place. In Short: Echinodorus gives you a mixed looking plant with plenty of color on its leaves. Fish will enjoy the multiple layers of leaves provided and pass between them often. Noticing poor health can be difficult as the leaves come pre-spotted, so give your plants an extra inspection when determining health. Looking to set up a brand new planted tank? check out our planted aquarium guide as we create a 10 gallon aquascape with tall stemmed plants!